As the saying goes, good things take time. In November of 2014, a family approached us to design their lakeside vacation home from the ground up. They desired a home where the whole family could enjoy skiing in the winter, waterfront fun in the summer, and socializing with their neighborhood friends year-round. It was an exciting undertaking, but not without its challenges. Nearly a year was spent working with the town on demolition of the former house on the property and deciding on guidelines for the new house to be constructed. In November 2015, Cristina Marais began working with the client on an interior design plan, while Rob Carty and Tim Giguere finalized the overall design of the house. Finally, just a few weeks ago, it was move-in day! Read on to learn how this home, a long time in the making, finally came together as a beautiful retreat for the entire family. Though this home is physically compact, an open-layout living room, dining room, and kitchen were essential, give the clients’ love for entertaining. They requested a casual, modern aesthetic throughout that would mesh nicely with their tranquil surroundings. Here in the living room, a neutral color palette and with interesting textures and a natural stone fireplace offer a laid-back elegance, while the chicken wire orb light (spotted by the client in a restaurant) creates a focal point with personality. 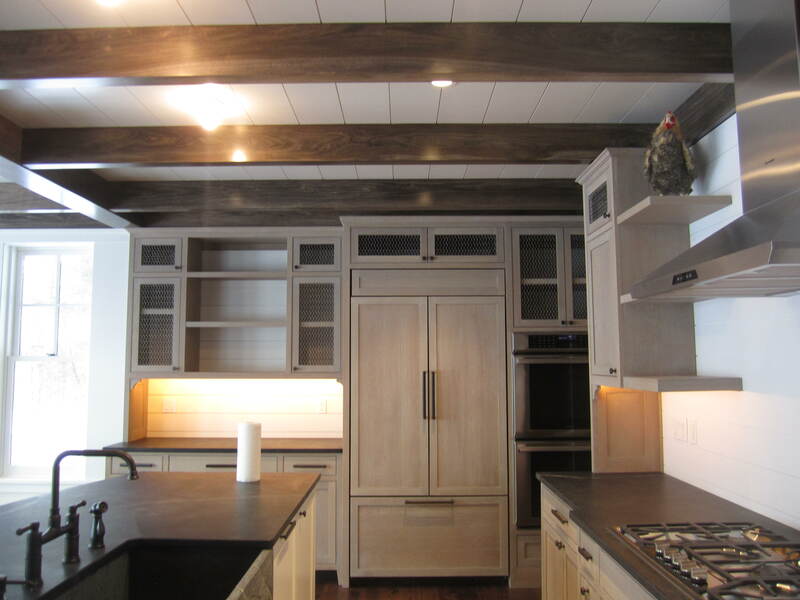 In the kitchen, the client requested a rustic, French country aesthetic. We achieved this through a matte finish on the cabinets, dark bronze cabinet hardware, and chicken wire detail on the upper cabinets. All in all, it took almost a year to find the correct wood type, texture, color and finishing product, and technique to achieve the look of the wood. Now that the kitchen has come together, it was clearly well worth the time and attention to detail. 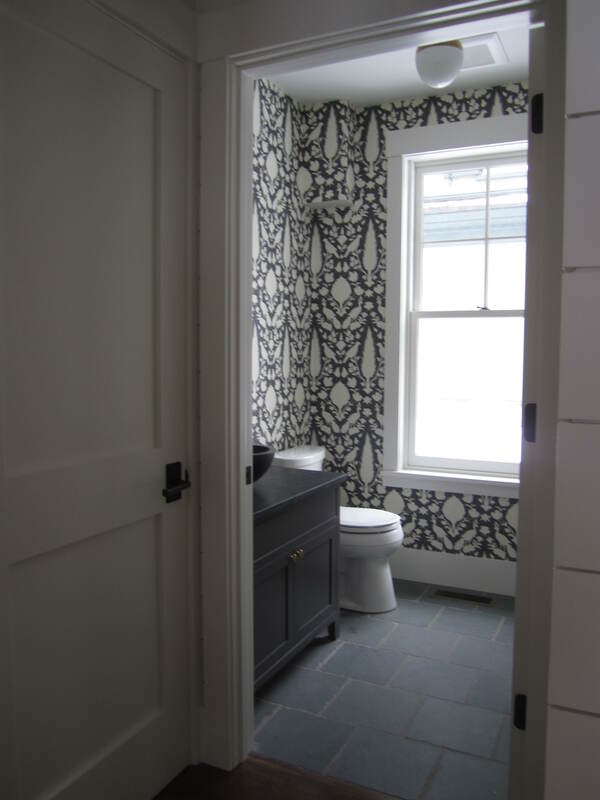 There’s no place like a powder room to make a statement, and this cream and black Schumacher print is proof. Because this pattern was such a scene-stealer, we balanced it out with slate tiles and a vessel sink for an elegant — but not overwhelming — look. TMS participated in the selection of furniture for the living room and master bed room, which both include some truly stunning pieces. 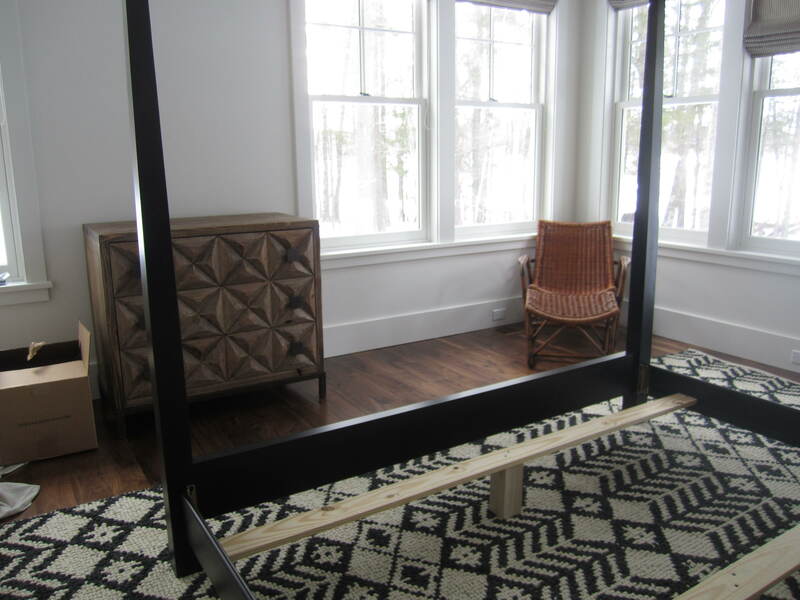 We carried the New England-chic aesthetic from the rest of the house into the master bedroom with a black four poster bed made in Maine and a black and white patterned rug by Serena and Lily. We then rounded out the room with a fun carved wood dresser and a rattan side chair and ottoman. Children’s bunk beds with built-in storage. With owners who love to entertain and an idyllic lakeside location, it’s no surprise that extra space for guests and plenty of storage were key factors in this design. 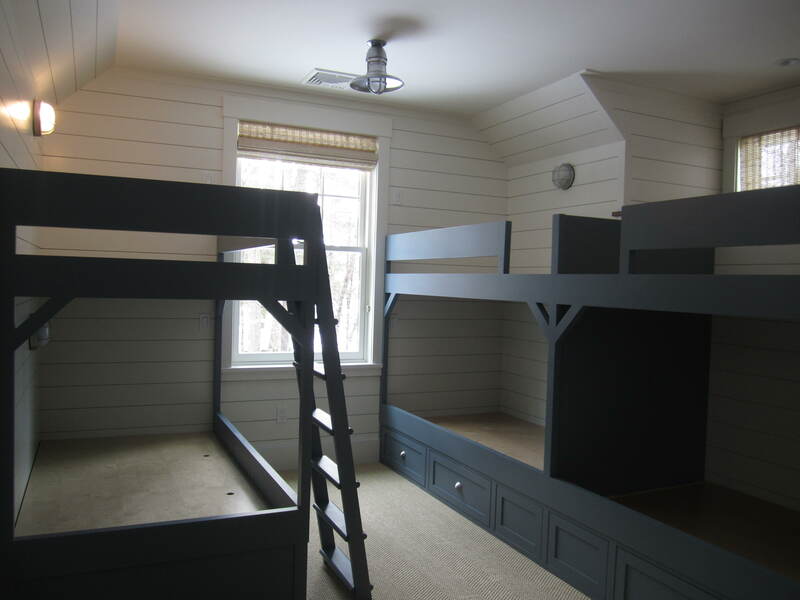 The children’s room (above) holds six bunk beds, complete with an individual reading light for each. 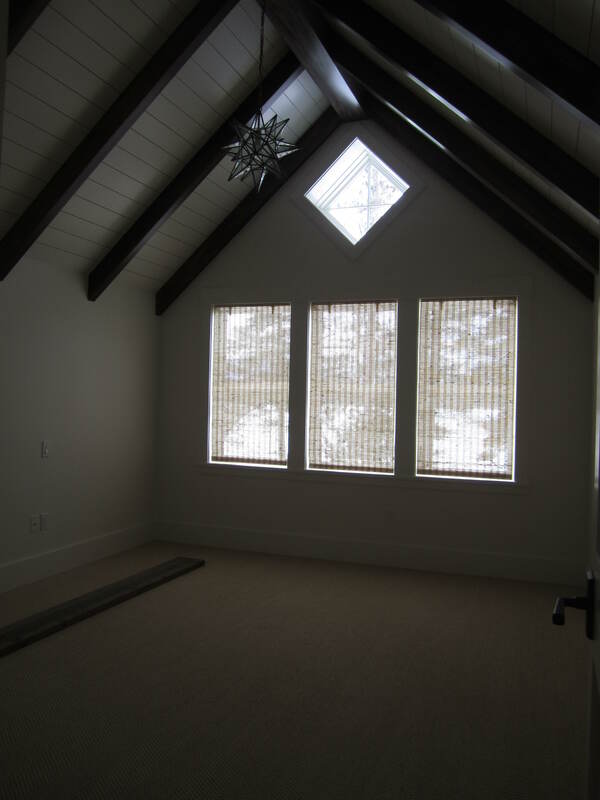 The space above the garage (below) includes a guest suite for visitors who require more privacy, along with ample storage space for skis and canoes. Guest suite and storage area. All in all, this home was unlike any project TMS has tackled before, and in the best way. 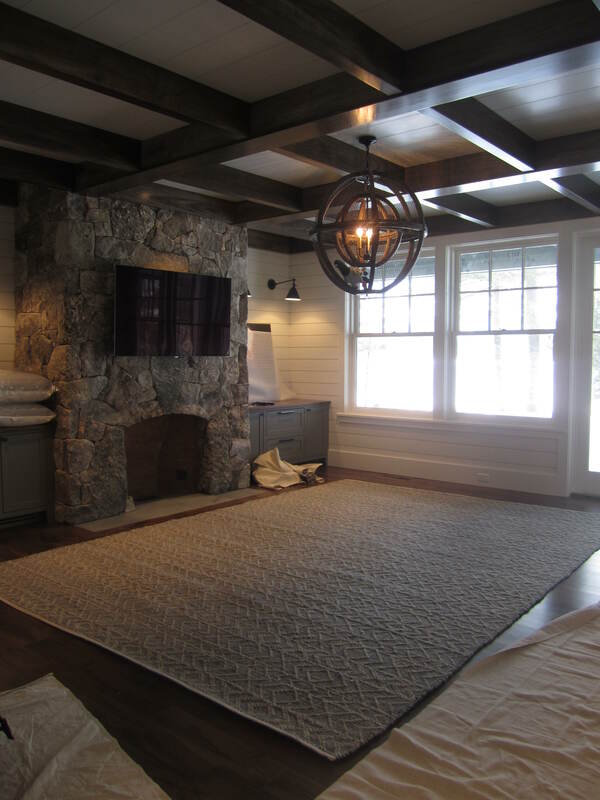 We had an opportunity to combine traditional elements with contemporary design to achieve a look that’s entirely new, yet fits in effortlessly with its New Hampshire setting. After a few years in the making, we’re glad this family will be able to enjoy their lakeside getaway for years to come. If you’d like to design your own dream vacation home from scratch, we’re able to work with you every step of the way. From initial design to the tiniest details, we can do it all. Contact us today for a consultation.